The 2018 Bologna Children’s Book Fair—the largest of its kind worldwide—is set to run from March 23-29. This year marks the 30th consecutive year for Taiwan’s participation in the global event’s The Illustrators’ Exhibition, starting with the official selection of Su-hsia Hsu’s Water Buffalo and Straw Man in 1989. 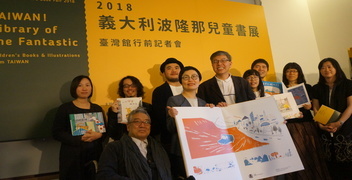 Over the last three decades, a total of 43 Taiwanese illustrators have been selected 59 times at this prestigious event. Organized by the Taipei Book Fair Foundation (TBFF) under the auspices of Taiwan’s Ministry of Culture, the 2018 Taiwan pavilion is curated by Page Tsou and themed Taiwan! Library of the Fantastic. In addition to a special exhibition celebrating 30 years of Taiwan illustrators in Bologna, the pavilion also features a variety of seminars and book signing events featuring Tsou, Chu-li Chen, Jimmy Liao, and Leo Tang, as well as the five artists selected for this year’s book fair. 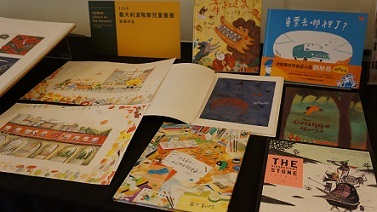 They are set to demonstrate Taiwan’s prowess in the art of original picture books. 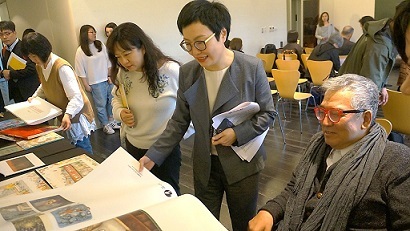 At a March 20 preshow media event, MOC Deputy Minister Hsiao-ching Ting said that the digital exhibition showcasing 30 years of Taiwanese artists and their works in Bologna is set to bring a rich and profound sensory experience to the showgoers in Italy. Ting highlighted the previous 59-time selections of Taiwanese artists’ works in Bologna as testament to the country’s achievement in illustration art, which speaks to the global readers by transcending the limitations of language. Her remarks were echoed by TBFF’s director Rex How, who noted that a picture not only speaks a thousand words but also resonates with the reader even better than printed words. According to TBFF chairman James C. M. Chao, five Taiwanese illustrators are among the 77 illustrators selected this year from over 1,000 candidates. Chao also added that Taiwan’s diminutive size belies its creative potential. 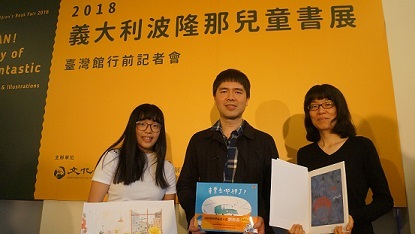 Jender Books chairman Lai-tang Luo, a fervent supporter of Taiwan illustrators, also said he is optimistic about the market potential exhibited by local artists, and will continue to sponsor their trips to Italy. 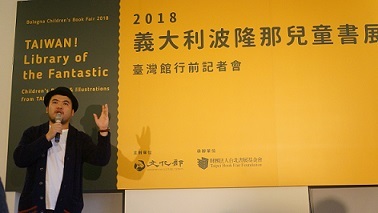 Hsiu Yin Wang, executive director of TBFF, noted that the 2018 Taiwan pavilion has been expanded to cover an area of 192 square meters, complete with a 12-meter-long book wall, a 100x70 cm portfolio installation, and three large-screen projection displays that showcase selected works of local artists for the Illustrators’ Exhibitions over the last three decades. Continuing the acclaimed Museum of the Fantastic from last year, this year the Taiwan pavilion will also provide a peaceful environment for showgoers to experience Taiwan’s fantastic illustration art, according to curator Page Tsou. Taiwan has shown increasing attention to illustrators in recent years, according to feature illustrator Leo Tang. Tang is enthusiastic about absorbing new creative trends at the book fair. This sentiment is shared by Sara Kuo, consultant for the Taiwanese pavilion’s international publication project. Kuo said she hopes to enhance the global competitiveness of local publications via exchanging viewpoints with consultants from other countries. Illustrators selected for the event this year—including Hsu-Kung Liu, Cindy Wume, Yun-Zhu Liu, and Chuentz Wang—all expect the experience in Bologna to enrich their future works.